The Sandlighter's promenade in Belize City was designed in the mid 90's as a part of a major infrastructure project, a prime public space, where city residents could breeze out by the sea, or take a morning stroll along the shoreline. 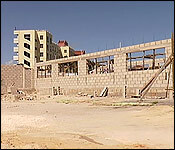 The area is right on the sea front next to the Princess - across from the Mexican institute. But a part of this prime real estate with sea frontage is now being developed as a pizza parlour. It's raised some eyebrows and caused some political turbulence, because this is the city's property, and a public space, now being developed for private interests. The news tonight is that construction on the project - which started earlier this month has ground to a halt - because of a stop order from the Department of the Environment. And while the issue appears to be regulatory - we get the sense that it's actually political. 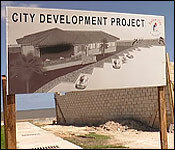 UDP voices have been making noise about the project because it is authorized by the PUP Belize City CouncIl and the developer Haisam Diab is considered to be well connected with the PUP. "About a year plus ago, when the UDP was in control of the City Council, I had approached him with the idea of doing family type orientated business and we had proposed to him that if we could lease the property basically we would build a building on the property and after a certain amount of time the property would go back or the building would go back to the City Council. I had met with the then mayor Darrell Bradley, Joe Bradley, Councilor Theus and they had all expressed support in favor of the project. The UDP council lost and PUP council came in. I then went back with the same proposal. The proposal, after careful review and scrutiny was approved. The plan went in to the council, it was supported unanimously by the councilors and we then entered into a lease agreement." "This lease was entered into on the 7th September 2018 between the council and Mrs. Katerina Diab. It is a 13 year lease at a rent of $2,000 per month which is for the land- the rent amount is for the land, it is not for any building because it is unimproved land at this point in time. The agreement is that Mrs. Diab will develop this property into a restaurant as described and the intended investment is to be about $300,000. You can't improve a property for $300,000 and at the same time pay rent as you go along. So, the agreement is, as with any other lease of this nature where there is improvement to property, this improvement is an upfront payment of your rent for approximately 13 years. So, once the investment is made, it is built on the council's land- it is the council's land at the end of the day, not Mrs. Diab. So, what she has done in essence is to prepare her rent for 13 years." "Basically it is Moe's Pizza Grill 2. We will be selling pizzas and salads and all kind of treats for the kids. Nothing to do with a steak house; I don't know where they got that one from. Secondly, we will not be applying for any kind of hard liquor license or anything like that because that is far from what we want to do out there." So, Diab says wants to put a Moe's Pizza branch there, and in a release, the City Council says, quote, "(The) area which was once ominous with poor lighting…will now be uplifted with a family-oriented restaurant…(with) a child-friendly…playground…along with ample parking to alleviate traffic congestion." End quote. And while the City says it has approved the plans, the Department of the Environment says it has not. The DOE issued a stop order last Thursday. Today, the developer told us what it's about and why it doesn't add up to him:..
"We got a stop order from the Department of Environment. With that stop order, basically they came out there and asked us three questions: 'on this plan we don't see anything for the disposal of garbage, 1; we don't see where your grease trap is going to be, 2; and 3, how are you going to dispose of your sewer?' I then visited the Department of Environment, Martin Alegria, and we put in a letter informing them how we would have handled all the issues or questions that they had towards the project. He informed us, 'okay, give us some time we will review it and we will get back to you.' That is where we are now. The project has stopped, we had many workers out there and we just basically got the stop order to stop. We had to send home all the workers and since then the project has been abandoned and we are waiting to hear from the department of the environment right now. For a project so small, I didn't realize that the Department of Environment would get involved, it is just a restaurant; there are many restaurants in Belize and I am sure they don't go through that type of scrutiny." "Do you think that it is political? We have heard Mr. Finnegan on the radio." "Well, I wouldn't have thought it would have been political but after hearing people calling me and telling me, 'bwai, they are attacking you on the radio,' then I would almost like to think so. But on the other hand I am surprised because I know Mr. Finnegan extremely well and he knows my number, we are good friends, he could have come and asked for the plans and I would have been more than happy to show and disclose them to him." "My opinion is that I don't think that the development should have triggered DOE. DOE has been triggered and we are dealing with them in accordance with the law." "I know that you all have gotten City Council's various approvals but in such a case when buildings are so close to the sea, isn't it automatic that approval's from the Department of Environment in Belmopan are required?" "The overriding consideration under the act is whether or not there is going to be a significant impact on the environment. So, the question is, is a restaurant of this scale, which is not a large restaurant, is this going to have a significant impact on the environment? As far as I am aware, this development isn't over the sea. So, it is not interfering with marine life as such. This is the simple construction of a restaurant on a plot of land. Yes, it may be near the sea but it is on the land. So, I don't know what environmental impact the Department of Environment considers that the development will have. We are looking at the possibility of an appeal, a judicial review in relation to having the stop order lifted but we will wait to hear from the Government and to see what the decision is moving forward; if the stop order will be lifted by the Government or if the Government is going to persist with the stop order and what recourses are then available to the developer." Diab said 10 people were working on the project. But, the other angle on it is whether the former UDP city Council did entertain the project. Diab says that's where he first floated the idea - but former mayor, Darrell Bradley says otherwise. He told us in a text message, quote, "Absolutely at no time did I approve any such project…At no time was this considered or approved by my administration…"
"I spoke with the former mayor, he sent me a text when I asked him about it and he said this is something that, 'absolutely at no time did I approve any such project. This is something that the current PUP approved. At no time was this considered or approved by my administration.'" "If the previous mayor is saying he knew nothing of that then that would be a shock to me. Since listening to the Wave Radio station I believe his father confirmed that that was tabled or at least it was brought to Darrell individually and personally. So, to hear that is a shock to me." The Belize City Council found itself having to respond over the weekend to media queries about a concrete structure measuring 45 by 104 feet that is being constructed on Sandlighters Promenade on Marine Parade. Media inquiries focused on who was building the structure and for what purpose and what was the property arrangement. She further stated, “With approved plans, we have entered into a lease agreement with an investor to restore and improve the aesthetics of the immediate area. An area which was once ominous with poor lighting and nominal community activity, will now be uplifted with a family-oriented restaurant. The planned restaurant will provide a child-friendly recreational playground, a well-lit and safe facility for the area, along with ample parking to alleviate traffic congestion. “Revitalizing this area aligns with our Council’s vision to not only create economic growth and employment, but also maximize on our waterfront capabilities, similar to other countries in the region. We anticipate, between all the necessary licenses, along with the lease agreement, to generate an annual revenue stream for the City. 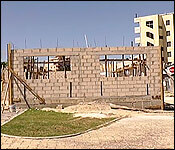 In addition, creating (18) immediate jobs and numerous employment during the construction phase. That development plan, however, has generated a good bit of controversy for the present City Council of Mayor Bernard Wagner, and today, it was learned that the work on the project has grounded to a sudden stop, because of a stop order that has been issued by the Department of the Environment on October 17. While the Belize City Council’s new communications manager had failed to specifically identify who the developer of the project is, the developer came forward today in a press briefing. The developer behind the project is Haisam Diab, who appeared in an off-camera press briefing along with attorney Ashanti Arthurs-Martin. Diab said today that the project is something that got started under the previous United Democratic Party council of Mayor Darrell Bradley. Diab said that he had met with Mayor Darrell Bradley, Councilor Theus and Jose Bradley. “It was a win win situation for everybody,” Diab said. The plan was for a structure that cost $300,000 and the property would be leased for 13 years. “After 13 years the building goes back to the council. They own the building. We have no intention of purchasing the property,” Diab stated. Diab explained that work has stopped on the project because of the DOE stop order, which was issued because the DOE has concerns about the facility’s garbage disposal, grease trap and sewage disposal. Diab said that he told the DOE that they had been waiting for someone to return to the country to complete the plan. When the person returned, Diab said he returned to the DOE and explained to them that they had everything in place. “Right now we are waiting for the DOE,” Diab said. The former mayor, Darrell Bradley, however, has denied any knowledge of the project, and said that his council would never have undertaken such a project without public consultation. Additionally, more controversy was spawned by the project, when Joe Bradley, the father of Darrell Bradley, acknowledged on his Fus Ting Da Mawning talk show that he knew about the project from when his son was mayor of Belize City. Diab said that he is building on the land and not on the sea, and that he did not realize that such a small project would require Department of the Environment clearance. Diab stressed that they would not be applying for any kind of liquor license. “All we want is a place where people can take their kids and have a good time,” he said. 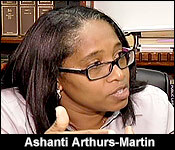 Arthurs-Martin explained the conditions of the lease agreement between the City Council and Ekatrina Diab, who is Haisam’s wife. The lease is for 13 years and the City Council has the option to terminate the lease anytime during the 13 years with a two-month notice to the tenant. The balance of the rent would have to be returned to the lessee.